For many people commitment is what they crave while for others it is more like a curse word. There are many different levels of commitment both physical and emotional and it is often a cause of contention in a relationship. Commitment is often about security and making your partner feel loved and settled. People need to feel that they can trust the other person and know that they will be there for them. 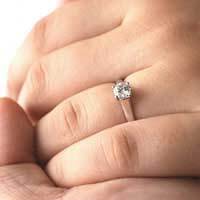 By offering a commitment, however big or small, you are offering this security. If you are not interested in committing then that is your own choice but you need to be honest about your feelings as leading someone on is unfair and selfish. Commitment means different things to different people. For you it might mean marriage and kids while for your partner it might mean turning up at the pub when they say they will. There is nothing wrong with either definition as long as you are both on the same page. Sit down and talk to your partner about what your expectations are and what commitment means to you. If your ideas are very different then you need to try to compromise. Explain why your definition is important to you and what they could do to make you feel more comfortable. Once you have decided what your definition of commitment is going to be it is important that you stick to it. Don’t agree to something that you know you won’t do just to make the other person happy as it will eventually cause a lot more problems. It might be something as simple as saying you will come home when the pub shuts, but by keeping your word you will prove that you are serious about the relationship. There will probably come a time in your relationship when you want more commitment. Maybe when you started out you were happy with agreeing to see each other twice a week but now you want more. Or perhaps you feel ready to move in together or take your relationship to the next level. Raise the subject with your partner and see if they feel the same. You may need to give them time to think about it and come to terms with the idea. If it turns out that you have vastly different ideas on how much you should commit and where your relationship is going then you need to decide if you are happy with that. Yes, they might change their mind, but they also might not. There is no point hanging on to the distant hope that they will commit to you more if it is blatantly obvious that they won’t. Most relationships reach a point where you have a level of long term commitment. This may be in the form of buying a house, getting married or having children. It is not unusual for people to get a bit scared at this point. However much you love someone or want to be with them, the thought of committing your life to them can seem, like a massive move. There is nothing wrong with feeling this way but you need to think logically about what you want out of life and try to curb your fears. Sharing your feelings with your partner is not always the best things to do as it may fuel their insecurities. Talking to a friend or family member for reassurance is a good idea though. Remember that most people face the same emotions, but to truly make the most of any situation you need to commit to it. The more you put in, the more you get back.